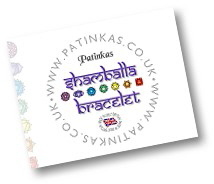 Beautiful Shamballa bracelets, handcrafted here in the UK using the highest quality 10mm Hematite beads, quality soft, but hard wearing cord and a genuine, Czech clay-crystal, pavé Shamballa bead. These are not cheap, foreign imports, but a quality, British product. Bracelets are in the design shown top right, but with a choice of colour for the main Shamballa bead. They come in a white glossy presentation box with a gift card plus while stocks last, you’ll also receive a free silver card gift bag with rope handles. The perfect, complete present package for a friend, family member, loved one; man, woman or older child, or simply treat yourself to one! the Highlands). Other locations please contact us for a price, including international destinations. Want your bracelet in another colour? We can make you one using coloured cord instead of black for the same great price. Colours like Hot Pink, Turquoise, Red or Blue. Please contact us for details. Hematite is a lovely stone, with many beneficial qualities. It’s said to be very protective, but its beautiful, dark-silver, almost metallic looking colour belies its true, inner heart. It gets its name from the Greek word for blood, Haima, because in its natural, fine-grained state it’s a blood-red, iron-rich mineral. In 1996 a probe from an expedition to Mars identified just this type of Hematite covering the surface of the planet, which is why Mars appears red, giving rise to its nickname; the 'Red Planet'. Legend has it that Hematite formed in the ground from the spilled blood of warriors wounded in ancient battles; their spirits imbuing the crystal with protective properties never afforded to their bodies as mortals, making Hematite the 'Warrior's Stone'. Therefore, when strength, courage, protection or fortitude are needed, Hematite's your stone!